We are in the middle of the summer heat, but it will be October before we know it and the thermometers will start to swing into freezing temps soon enough. Now is the time to schedule a service of your dry-type fire sprinkler systems to drain those low points and prevent pipe breaks. This simple action will help you and your business avoid thousands of dollars in costly broken pipes and water damage. A “dry fire sprinkler system” does not mean water is not used for fire suppression. 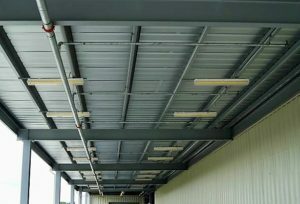 It means the pipes are not pressurized with water before activation because they are utilized in areas of buildings that are either subjected to very cold temperatures, such as unheated warehouses, or exterior areas like the one pictured at left. These systems may be isolated or attached to a “wet system” covering the rest of the structure. Either way, moisture has a tendency to accumulate inside and needs to be addressed proactively. We recommend September as the optimal month to have this service performed in the Portland area prior to potential freezing temperatures. Contact us today by email or call us at (360) 694-9199 to schedule an appointment before the freezing temperatures arrive!